Sgt Albert Ford was instructing men in live grenade throwing at Gorre, France. A grenade was thrown so that it hit the traverse and dropped, smoking, into the trench. Ford pushed past the man and managed to pick it up and throw it clear. It exploded immediately on leaving his hand. 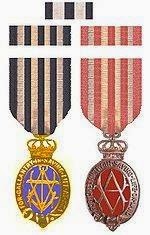 In 1940 the Albert Medal was replaced by the George Cross. In 1972 Ford exchanged his AM for a GC, the only Royal Welchman to receive this rare award.